Ralf Maro Photographer from Germany - Monday September 5 as told to me in the small restaurant near the Jojo Market and across from the Evacion Restaurant. There is a dangerous precedent being set that is destroying possibly whole countries cultures and economies. 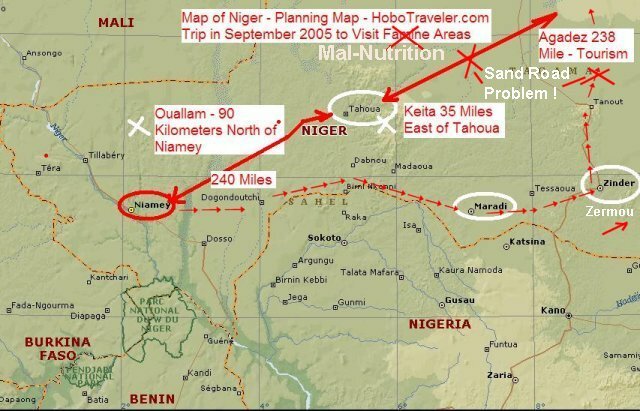 The problems of Niger as best I can suss out in my for sure, not critical analysis or simply a project for the Indiana Purdue University Agriculturalist to solve, which foods can be grown in Niger that will provide the proper nutrients to stop mal-nutrition problems. I think the problems probably are in a huge report on some shelf in the office of some United Nations idiot. However now the people need to discover where on the planet the same problems occurred and apply the same solutions. There is never the unique problem on the earth; it is always a repeat of history. This all started because I am thinking about how stupid a problem there are in the roads of Niger. If a person analyzes the country in a string of thread or maybe the proper term is deterministic way, then you will see a causal relationship between all problems. One beget the net, influences the next, and by the time you are to the end, there is nothing. I just traveled in the last 15 days from Niamey to Maradi, from Maradi to Zinder, from Zinder to Zermou and back to Zinder, then from Zinder to Agadez. From Agadez to Niamey by bus. If the French Version of Médecins Sans Frontières has been here for 10 years, and so has World Vision, Oxfam and most of these groups, then why is the only way to get to some of these cities stopped by small stretches of highway blocking the road. The United Nations goes by big four-wheel drive SUV to inspect an area, many times the problem is so simple as there are small stretches of road where the large truck get stuck in the sand. I am annoyed as I receive terribly silly answers to simple problems suggested to me by people sending emails. For instance, I say many ridiculously amounts of times that I cannot make telephone calls, it is easier to use the internet. However, on a daily basis, someone says, call here, or call there, or use your cell phone. By the time, I arranged and got a cell phone to work in Niger properly, and the only good use would be to call my parents, nothing to do with Niger, then I can go to the place. A person from England says she emailed and called a travel agency on the internet in Zinder to help me go to Zermou. I really only wanted to know that the place was actually called - Zermou - and not - Zermo -. She tries to make contact with a contact of a contact… aagh, forget this, it is not the solution, they are the problem. I gambled correctly and the place is Zermou and not Zermo as she originally sent me, if I would have proceeded to follow the guidelines as she sat down or thought would work I would have seen nothing. Instead, I commissioned two Motorcycles to take a difficult trip from Zinder to Zemou, because hell or high water I was going to see one small village they said is a problem area. The stupid part is the difference between efficient, lazy, and effective. Most of these groups spend millions of dollars to report a problem, define a problem and some of these problems could be stopped immediately with a few thousand dollars of well-placed money. Some targeted patches could fix some critical and essential problems. In construction terms, I think they need some Punch Out workers, or a workers that comes in and fixes some small stupid problems and stop working on such monstrous problems. Solving many of these problems is like the ugly guy in the book the Ugly American where he takes a bike and shows them how to pump water; he did more good quicker than all the Embassy workers in the world. Start to see how many other problems influence the problem. Make a list of all the small problems that stops the solutions. Fix the easy ones first and proceed to the smaller ones. It is an application of the Rene Descartes - Methodological Doubt - Analysis to these problems, working only on the certain problems for the long-term. Sorry to say, these children have been dying of Mal-Nutrition and will continue to die of Mal-Nutrition, I do not see any solutions. I only see the NGOs coming in and putting band-aids on a problem that will be here again next year. A small task force of super intelligent construction workers could get half of these problems solved quickly. Men that will work in the sun, bake off their butts and not complain. First I want you to know that three words are used to describe countries such as Niger. These terms only have value when compared one country to another. If you wanted to call a country under-developed use this table. Developing, I suppose you could compare years and see if Niger goes up or down, and say that because it is moving up on the list it is developing. Personally I will say, all countries are moving the bar of development up a the same time. There is always an increase in roads, water, cars, food, etc happening in all countries, therefore every country is a developing country because they are adapting and accepting development. Only countries or more specifically culture like the Taliban in Afganistan have moved their cultures backwards. Normally religions will try to regress progress as defined by the HDI. Here is a good example of the country of Niger accepting and developing more food in Niger, This non-governmental organization called NGO's are educating Niger. The education develops the country. Why is Niger a developing country? Because it allows new ideas to enter the country from outside the country and then implements them. The government allows the country to follow the path of development, however not as fast as a highly developed country. This is alll a slippery slope, development happens when specific changes are summed up or tallied and counted, the HDI then moves the country up on its index. In reality this is also political whereby countries want to be the least developed so other governments send them money.